The most successful middle-market companies—those growing at least four times the rate of GDP growth—are 40 percent more likely to describe themselves as innovative than less dynamic businesses of their size, according to the National Center for the Middle Market (NCMM)’s “Organizing for Innovation in the Middle Market.” Overall, middle-market companies surveyed also fare relatively well with execution of innovation projects, reporting that 57 percent of ideas generated in 2014 made it to market. 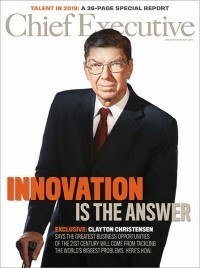 This success may be partly due to the fact that their innovation efforts tend to skew conservatively, focusing on familiar markets and knowledge rather than unmapped “blue oceans.” Furthermore, mid-market companies tend to use their own internal resources to generate ideas and to manage innovation risk carefully. The most effective innovators tend to engage the entire company around innovation initiatives, fostering cross-departmental interaction, as well as the involvement of senior leaders. They are also more likely to possess a well-developed set of capabilities and practices—formal processes, tools to track and measure innovation, attention from senior leadership—to better manage the risks they take. The statistics, tables and charts to follow offer insights on how the most successful mid-market companies foster innovation. This article is taken from the November/December 2015 issue of Chief Executive magazine, page 22. To subscribe to Chief Executive, click here.